Michael Sam, who on Saturday became the first openly gay player in the National Football League, celebrated the moment he was drafted by the St. Louis Rams by embracing and kissing his boyfriend -- an emotional moment captured by cameras that became an instant online sensation. The former University of Missouri defensive end broke into tears as soon as he heard the news over the phone. Sam, 24, was picked by the Rams in the seventh round. He was the 249th overall pick. Wow. Emotional video from ESPN showing Michael Sam getting selected by the #Rams. Amazing. So happy for him. 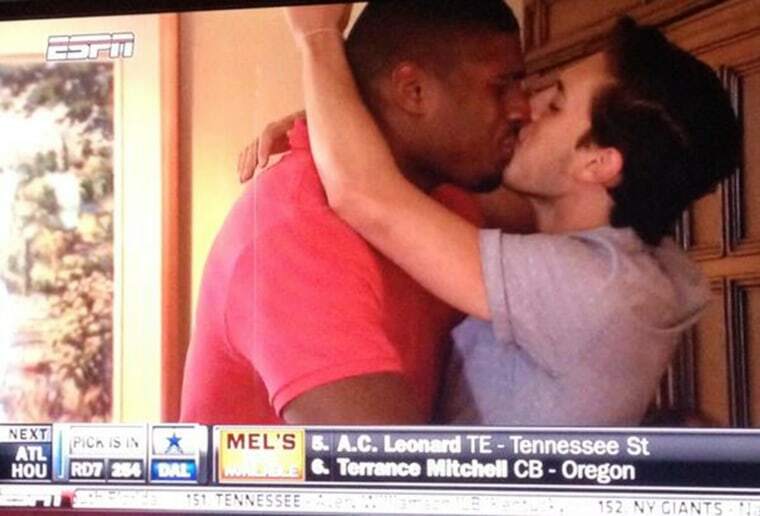 Michael Sam rejoicing and kissing on national TV. This is a great moment for the country. Congrats to @MikeSamFootball on becoming a @STLouisRams Welcome to the #Rams family. Welcome to #STL @MikeSamFootball !! Teammates again.